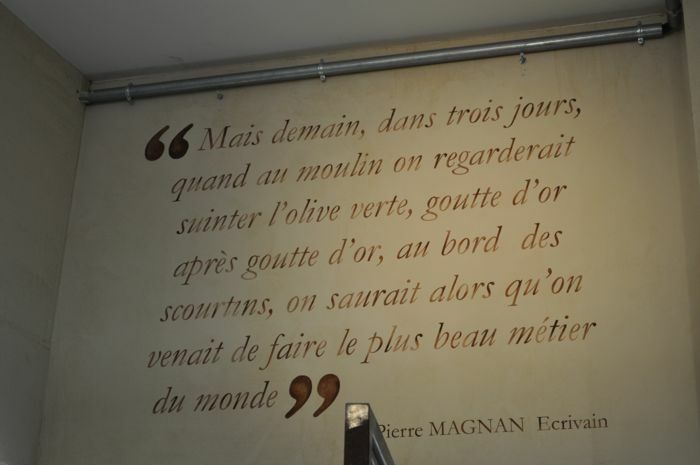 The other day, when I strolled up and down rue de Martyrs, the new food- artery in the 9th arrondissement of Paris, I stumbled upon “Premiere Pression de Provence” and discovered one of the best sources of olive oil in town. “Premiere Pression Provence” is like a spot of sunny Provence in the middle of Paris – and this is also thanks to the charming Nathalie who will advise you perfectly. The boutique on rue de Martyrs is one of ten in Paris. You can call it a chain – or more precisely: it’s the beginning of it. 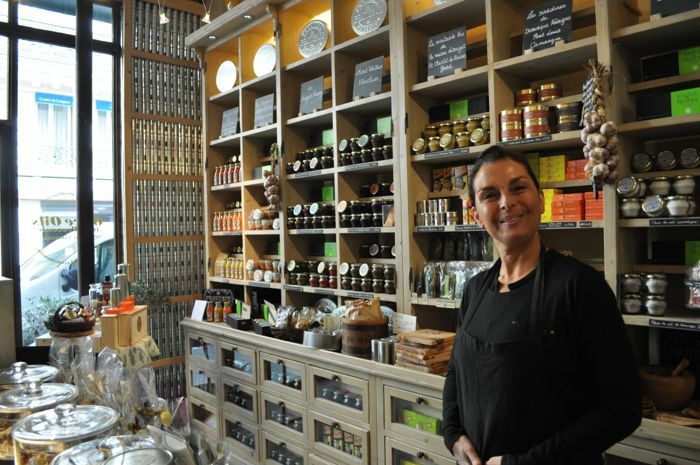 “Première Pression Provence” is the youngest baby of Olivier Bausson who already has successfully launched and developed another Provencal brand called L’Occitane selling natural beauty products from Provence. 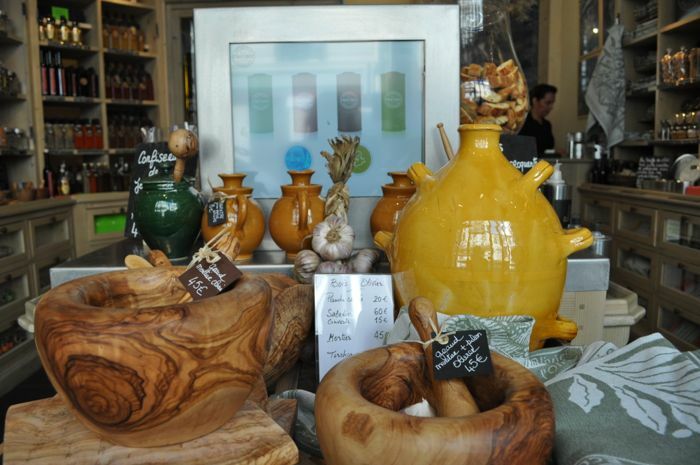 The idea this time was quite simple: bring French olive oil to French consumers. You might think I’m kidding and that there is nothing more natural. But you’re wrong. Actually only 3 percent of the French olive oil consumption comes from olives picked in Provence. In other words: There is something to discover for most of the French who would usually buy any kind of mixture from Greece, Italy or Spain. But don’t expect to find a classification by territories at Première Pression Provence. It’s all about taste here. You can chose between: “fruité vert” (oil from green olives with a taste slightly reminiscent of artichokes); “fruité mure” (from olives picked at the stages in between green and black with a taste of honey and almonds); and finally “fruité noir” (oils with a mossy, smoky flavour thanks to the beginning of fermentation). The choice of oil and the quality is amazing, but you can also purchase a lot of products that go with it: tapenade, pâté, even cheese. And in case you need a nice present, they have aprons, dish clothes, wooden forks and spoons for salads. In a word: here you get all you need to create the atmosphere of Provence on your terrace, just imagine the smell of cypresses and the sound of cicadas. Bausson is a man with green convictions. His producers are handpicked if I may say so and they talk about their work and their “terroir” on the blog of the website of Premiere Pression Provence. Apparently, Bausson tries to develop a fair trade between passionate producers and passionate consumers and wishes to limit intermediaries as much as possible. In case you need a little present from France, try your luck at one of the 10 locations of Premiere Pression Provence in Paris.